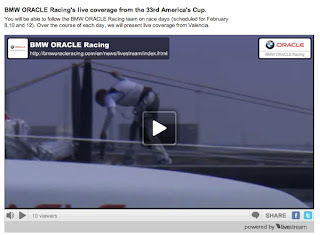 BMW ORACLE Racing will produce unprecedented on-line coverage of its challenge for the 33rd America’s Cup, beginning with a team press conference on Friday February 5. The "Race Day" coverage, on this website (click here), will feature hours of live, original programming each race day, including the official live feed of the racing from the Host Broadcaster. "Race Day" programming kicks off on Monday, February 8, the first scheduled race day of the Match. The Dock-Out Show – watch the team prepare for battle as they leave for the race course. The Dock-In Show – cheer on the American challenger as the team returns to shore following the race. "We’re excited to be able to share our America’s Cup experience with our supporters, and we’re glad so many people will be able to be a part of what is sure to be an incredible Match," said Russell Coutts, CEO of the team. "The America’s Cup has always been about the latest in technology, both on and off the water. Today it is easier than ever for us to bring the story of our team directly to our fans, and with 'Race Day' that is exactly what we are doing." or on Twitter at: http://twitter.com/bmworacle2010.